Texas Parks and Wildlife Department (TPWD) will be stocking nearly 300,000 hatchery-raised trout into Texas lakes, ponds, and river tailraces for fun winter fishing. Neighborhood Fishin’ lakes in 11 urban areas around Texas offer family fishing opportunities in clean, well-lit spots in city parks with picnic tables and restrooms and will be stocked frequently throughout the season. For those who want to experience a true trout fishing destination adventure, the popular Guadalupe River fishery downstream of Canyon Lake between Austin and San Antonio will receive its first TPWD stocking Friday, Dec. 2. Temporary lease agreements with four privately-owned resorts provide free public fishing access to the river. 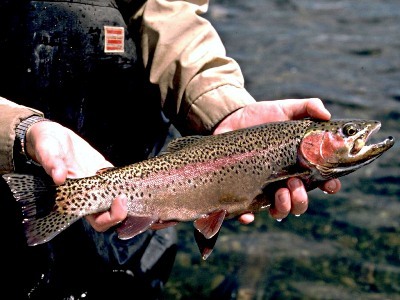 More than 100 additional sites around the state will receive one or more stockings of trout. “The hatchery-reared fish will bite almost immediately after stocking and typically will take a variety of baits, from whole kernel canned corn or commercial soft bait to artificial flies and even small spinnerbaits.” said Carl Kittel, TPWD hatchery program director. Fishing gear can be as basic as an inexpensive spincast rod and reel combo, a small plastic bobber, a fishing weight, and a hook. It’s also a good idea to carry along a pair of needle-nosed pliers to help remove hooks, and a five gallon bucket, small ice chest or fish stringer to keep your catch. Fresh trout should be kept cold on ice or refrigerated, according to TPWD. A summary of fishing regulations, list of trout stocking dates and locations, and other information is available at www.tpwd.texas.gov. For a list and map of Neighborhood Fishin’ lakes, see www.neighborhoodfishin.org.